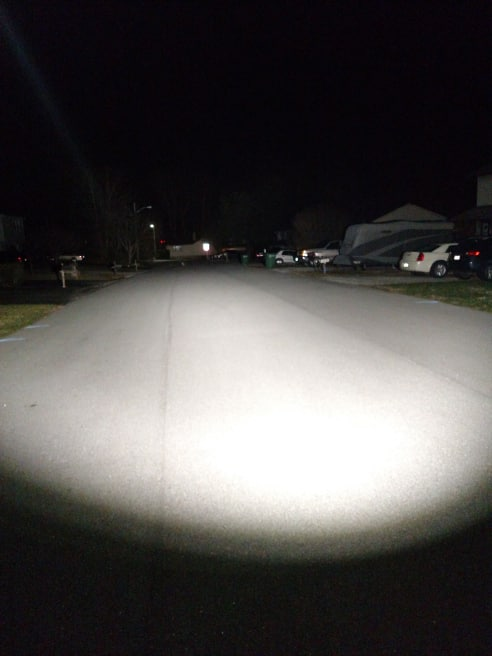 Prototype off-road/boating spotlight - King COB! Yeah, I spent a lot of time studying the Vero18 and I seriously considered using it but I like the efficiency of the bigger Vero29. BTW, I got the StratusLED driver and Angela-S in the mail this morning. Did you install the resistor on the adjustment pot? BTW, I found documents suggesting that this driver should be able to handle 200w. I’m trying to get the actual datasheet for the driver chip so I can reverse engineer it a bit. Well, the IC can be “programmed” to limit input current, output current, voltage….. So I suspect it can’t do 200W stock. It may need some components changed to do 200w. But the main IC can do 200w. Well, knowing we need a 7.3kOhm resistor on the right leg of the pot, we may be able to manipulate the max current by simply trying different resistors? 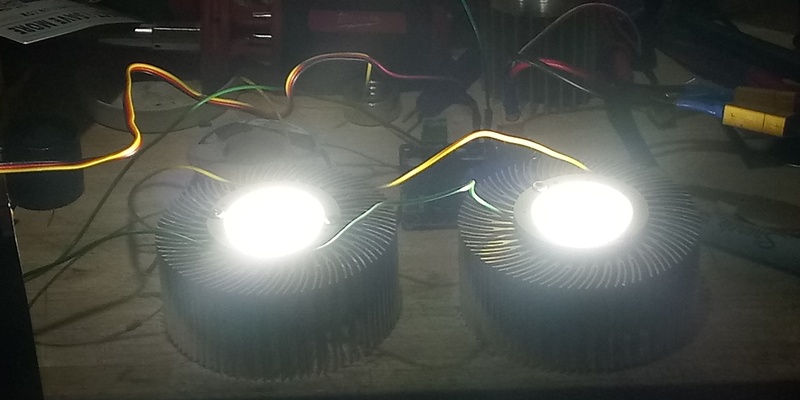 I tried the Bridgelux LED, and it’s like a mini Sun… the push in connectors are a huge plus and get the wires out of the way as well, as well as allow daisy-chaining. By the way, what version of the driver do you have? 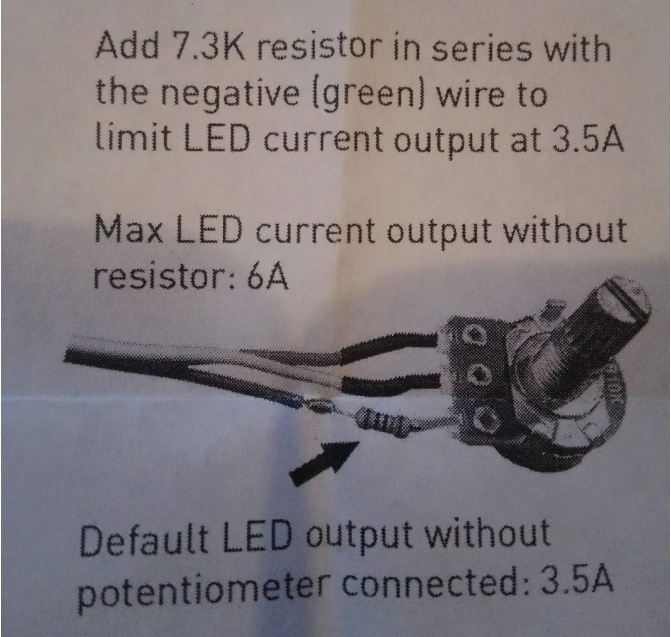 Mine do not have those instructions, and the pots are pre-wired with no resistor in series with the right leg. Well, something just popped on mine. 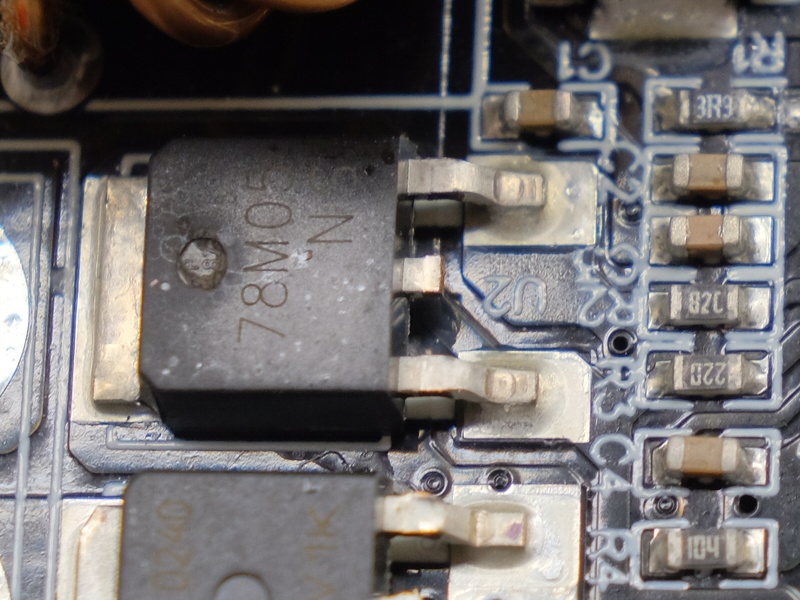 I think it was L78M05 a voltage regulator…. Does yours have an R07? Mine seems to be missing R07. Just unplug the battery, turn the pot back down, and plug it back in… should be good. I tried to kill mine with no success. Unfortunately, earlier this week I killed my other CXB3590, because I was to lazy to drill new screw holes on the heatsink. I just fixed the COB down with one screw. Cranked the knob up, and accidentally hit my heatsink, which shifted the COB. It didn’t take long to see the emitters die one by one. Placed COB in circular file cabinet. Sorry, R7. It’s near the mosfet. 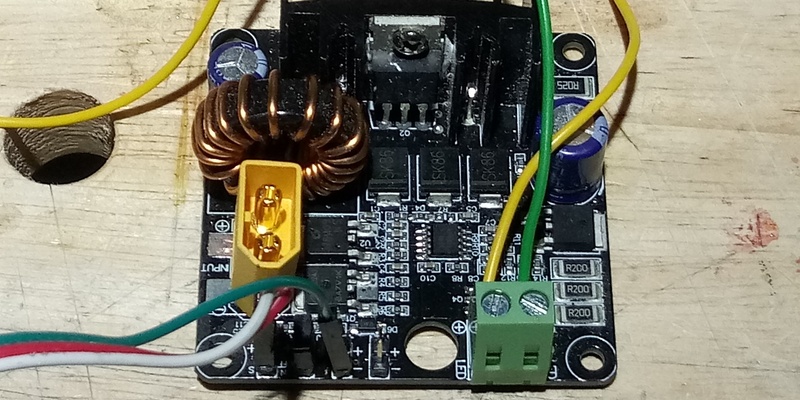 Thinking about this now, if this thing does truly pump out max 6A, I should be able to run two Vero29s in parallel at 3A each… I measured the voltage across the connectors for the Vero29 and I got 34V. We have an analog clamp meter at work, do you think that’s accurate enough? Well I have 2 spares if you need one cheap (I have 5 more for projects.) What version is yours? I’ll put up a pic of mine. Like I said before, I think it is programmed to limit output below that. 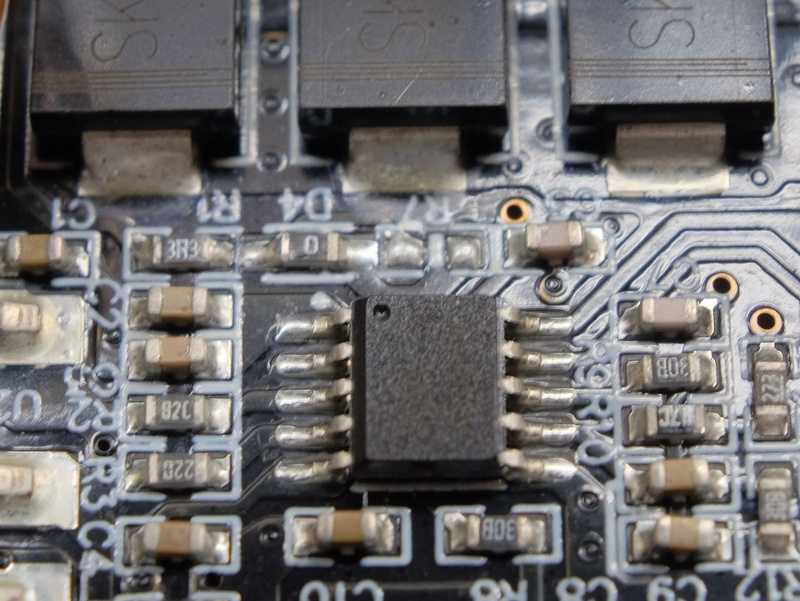 Then again, from what I saw for specifications on the driver chip and what Daniel at StratusLEDs has told me, makes me fairly certain he didn’t design it and doesn’t know how it works. A quickie test with the COB TIRs seems very promising. I need a proper heatsink and adapter plate however before I can do some beam shots. Almost impossible to hold everything together. As far as the Vero29… it seems to play well with the TIR. I was afraid the mounting ring of the COB would interfere with the optics, but it just happens to fit almost perfectly. I think though for focusing purposes I’ll have to set the Vero29 just a tad down, meaning I’ll have to mill a circular pocket for it. The TIR housing I have even has silicone gaskets! Even at “just” ~6500lm, the Angela-S is pretty awesome. I strongly suspect the Angelette-S is probably nearly ideal as it should have a slightly wider hot spot and a tiny bit more spill. This has me rethinking making a triple. A Vero29 capable of being driven at the full ~250w with one of these reflectors would be plenty. So I can’t turn the pot too far before the board trips. I’m getting 34V at the LED. Even with the resistor mod. However I was able to run two Vero29s in parallel daisy chained using a 1MOhn resistor in series with the negative leg of the pot. Not much diming however. With the CXB3590 I’m able to dim to almost nothing; but I suspect the resistor mod may help me get that pot all the way with the CREE CoB. Still no way however to measure current. Control photo of the street. This looks a bit darker than it really is. @LouieAtlanza, could you please link the TIR? I’m looking to make a similar build. The contact name is Duncan Deng. You could mention I sent you over. Shipping by DHL is fast but a little pricey. How do you plan to driver your CoBs? That reflector is a definite improvement over the other one. Nice! Shame my driver sploded. I was really excited to see what it would look like @18,000 lm. Though, I really do think the other reflector would be better. Datasheets suggest that I’m right. FWHM should go from ~23 to ~29degrees and it should lose a little bit of throw. I need to get the other reflector so I can switch between them. Shame my driver sploded. 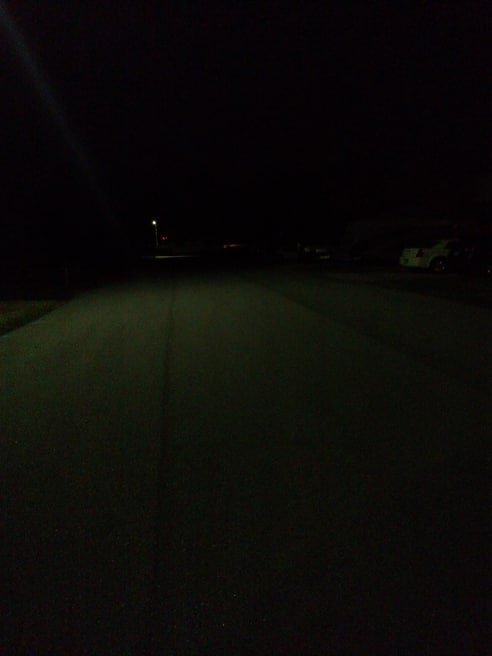 I was really excited to see what it would look like @18,000 lm. Though, I really do think the other reflector would be better. . . Datasheets suggest that I’m right. FWHM should go from ~23 to ~29degrees and it should lose a little bit of throw. I need to get the other reflector so I can switch between them. Did you just get a dud? Short somewhere? I’ve run everything from a 9V battery to a 6s2p LiPo configuration, and have not experienced that yet. I wish I burnt one instead of my CXB3590 that’s for sure! You probably could just find that voltage regulator and piggy-back it… can’t cost a lot. I’m going to replace the regulator. They’re only $0.40 from Arrow but I did also e-mail StratusLED to see if they would do anything. It’s just annoying because I’m going out of town tomorrow so I won’t get to mess with it again until at least Saturday. You have to bring FrankenCOB with you. Might find a good place to take pics in your travels! The place I’m going doesn’t have much of a sense of humor so I have to be careful what I bring. Honestly, I probably won’t take my camera. FYI, I don’t think the Angela, Angelette or Angelina reflectors are compatible with the Vero29se due to the height and clamp geometry. I’m glad I caught this as I was looking to buy some Vero29SE to play with. The non-SE Vero29 should work fine though. Oh, and this Angela-s with the CXB-3590 throws a literal wall of light at least 150m. I don’t have the numbers to calculate ANSI FL-1 throw for this combo but it’s probably ~250m or so at ~36w. I would check that, doesn’t the Ledil reflectors sit atop the Ideal clamp? Finally got my 900W DC booster. I ran two 3s2p 5200mAh packs in series, and was able to take the Vero29 to 37.85V and 3.28A… for an estimated 17500lm at about 140lm/W. I ran the rig for about 10 minutes, and the voltage on the fresh set of batteries dropped to 3.95V. So I’m thinking at 17500lm I can potentially have about 40-50 minutes of run time? So far I’m pretty happy with this boost driver, being CV and CC and fully adjustable. and programmable. I kind of like having the convenience of a pot to adjust output, but the down/up buttons work fine. 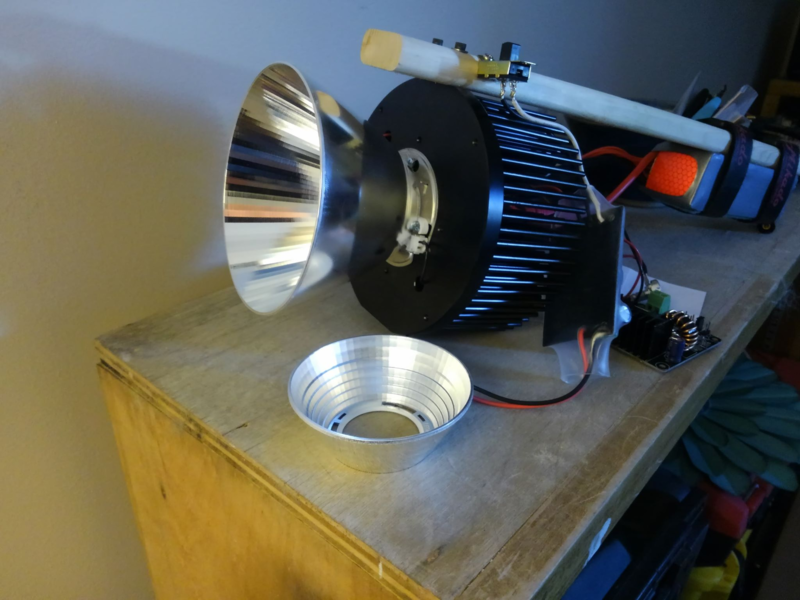 Next step – design a connecting plate to hold the CoB, lens, and housing on one side and heatsink/fan on the other, with a housing for the electronics and batteries.